Chinese President Xi Jinping returned to Beijing on Wednesday after his visit to Europe, bringing a fruitful outcome and the visit assures the cooperative trend of China-EU relations, analysts noted. At the conclusion of Xi’s visit, Chinese State Councilor and Foreign Minister Wang Yi told reporters in Paris that through the visit, the Chinese president has shown Europe and the world that China is standing on the right side of history, and will continue to promote China-EU relations, safeguard multilateralism and guide the reform of global governance, the Xinhua News Agency reported on Wednesday. Xi’s visit to Europe injects new impetus in China-Europe relations, Geng Shuang, a spokesperson of the Chinese Foreign Ministry, told a daily briefing on Wednesday. “China always views Europe as a comprehensive strategic partner and an indispensable global power. 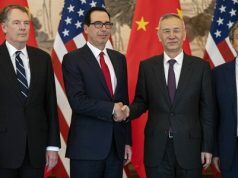 Together with Europe, we will fulfill multilateralism, increase stability and certainty in the world and inject more positive energy and impetus for international cooperation,” Geng said. 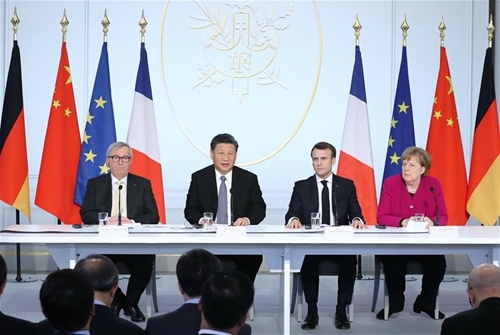 Xi visited Italy, Monaco and France from March 21 to 26 and held “unprecedented” talks on building new global governance with the leaders of France, Germany and the EU in Paris. During the visit, Italy became the first Group of Seven nation to join the Belt and Road Initiative (BRI) and also agreed to return 796 sets of Chinese cultural relics. China and France signed an agreement on future space cooperation in Paris, allowing France to fly its experiments on the Chang’e-6 mission. The application of 5G in Monaco, which will become the first country in the world to be fully covered by a nationwide 5G mobile network, promotes China’s efforts in information infrastructure construction in Europe, analysts noted. Overall, Xi’s visit to Europe was “fruitful” and the outcome “beyond expectations,” Ding Chun, director of the Center for European Studies at Fudan University in Shanghai, told the Global Times on Wednesday. In particular, Xi’s meeting with German Chancellor Angela Merkel and EU Commission President Jean-Claude Juncker not only reinforced bilateral ties but also sets the tone for the future of China-Europe relations, Ding said. China and Europe are not “rivals” as the “EU-China: Strategic Outlook” issued by the European Commission described, but “partners,” Ding said. 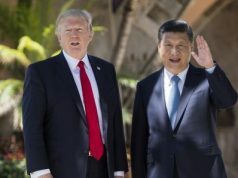 From the articles and speeches Xi made, European leaders and people could feel the determination and sincerity that China has toward China-Europe relations and Xi’s charm in handling diplomatic matters, which is another prominent outcome of the visit, said Zhao Junjie, a research fellow at the Chinese Academy of Social Sciences’ Institute of European Studies. Xi’s visit to Italy brought BRI to a new level. 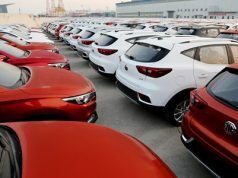 The cooperation with Italy, as a major Europe nation, will be an icebreaker for the BRI to extend to the European continent, Zhao told the Global Times on Wednesday. The BRI’s end point, either the maritime Silk Road or land Silk Road, is Europe, which cannot be replaced by other regions. But most European countries continue to hold a wait-and-see attitude, Zhao explained. On March 23, Italy signed a memorandum of understanding (MOU) with China to jointly advance the construction of the BRI. Italian Deputy Prime Minister Luigi Di Maio said the deals were worth an initial 2.5 billion euros ($2.8 billion) but had a potential value of 20 billion, Reuters reported. Under the framework, the BRI will be continuously enriched with trade deals and investments. Italy’s olive oil and agricultural tourism would be new growth points for bilateral ties and China might invest in the port city of Trieste, Zhao said. Trieste could be a key point of the Belt and Road Initiative, especially 21st Century Maritime Silk Road in Europe, which can spread benefits to more regions like southern and western Europe, Zhao said. Germany expressed its willingness to participate in the second Belt and Road Forum for International Cooperation in Beijing in April, the Xinhua News Agency reported. Some European countries remain concerned on issues like reciprocity, but EU members are open to learn about the initiative, so if they find the BRI truly mutually beneficial, their stance could be changed, Feng Zhongping, director of European Studies at the China Institutes of Contemporary International Relations, told the Global Times. During Xi’s European visit, he also mentioned an increase in third-party market cooperation under the BRI project, which Zhao said would offer new opportunities for European nations interested in BRI to work with China in new markets. After China passes its foreign investment law, European countries will find more opportunities and equal treatment in China, so this could be a positive sign, Feng noted.